I probably won’t post every time I make another batch of yogurt as it’s so easy and I have a feeling that I have a lot of yogurt making in my future. But, for this batch, we took the yogurt making another step further by using a starter from our last batch. For our first foray into yogurt making, we followed Dr. Fankhauser’s wonderful recipe, with great results. We used an organic whole milk and Nancy’s yogurt. Nancy’s is an Oregon brand, made in Springfield since the 1960s. It’s my preferred yogurt and I buy a lot of it every year. The first thing I did with our delicious batch after sampling it was to portion out 8 oz. of it into an ice-cube tray to freeze and serve as the starter the next batch. After frozen, I put them in a plastic baggie where they’ve been sitting for over a month. The day before I was going to make yogurt, I transferred the cubes to a covered bowl in the fridge and let them thaw out. 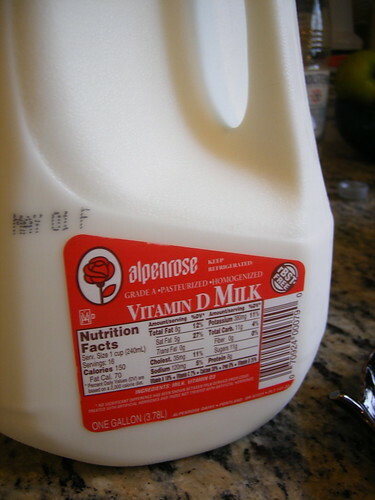 I considered all the whole milk options at my local New Seasons and decided to give Alpenrose a try. They are also a local, Portland metro, dairy who has been in the milk business for over 90 years. In addition to that, they have a wonderful grounds where they have built a replica “frontier town” for kids and families to play in, they have a baseball field and a velodrome where I’ve been a few times for bike races. They are an icon of an era gone by where big companies have a distinct role in the community and a desire to create a legacy that they can be proud of. And, it’s pretty good milk, too! To make a short story long, I used the yogurt from the previous set as starter and everything proceeded as usual. 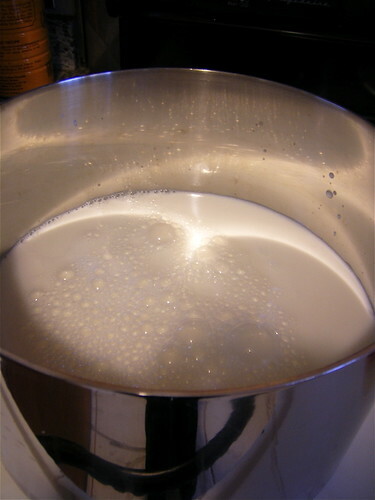 I took better notes this time and wrote down the time it took to heat the milk to the right temperature — medium heat for 1 hour to 185-F — and let it incubate overnight, at least 12 hours. It gelled really well, perhaps even better than last time. The flavor is somewhat less intense and less tangy than the last batch. I attribute this mostly to the starter but it could be the milk as well. I’m debating saving another 8 oz from this batch and seeing how it goes. Perhaps next time we can do a comparison taste test with an all-fresh batch and one made using previous starter. Check out this great article that Linnea sent me about making your own yogurt at the NYTimes. It has a really nice explanation of the bacteria and activity in yogurt and how your culture can really affect the taste of your yogurt.